I have always found Shobhaa De’s columns very interesting. I don’t really agree with everything she says but still I love the way she put forwards her views . Unfortunately I cannot say the same about her novel. It took me alot of effort to complete reading this book. The biggest reason behind this was that the crude road side Hindi and abundance of abuses in the book made it very difficult for me to connect to it and disrupted the flow of the story. I am not against usage of Hindi in English novels but in this book, it felt unnecessary and forced at a lot of places. Secondly, I hate the fact that the author has completely ignored the character of Sethji in the book. 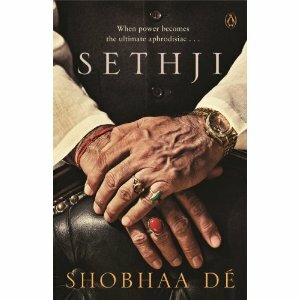 After a few pages you start wondering whether the book should have actually be called “Amritaji”- Sethji’s daughter in law. The character don’t make sense, are very shallow, loosely indicate to some political figures of our country and you can’t really relate to anyone in the story. There are details of characters and situations that don’t matter while a very important character has no mention in the first half of the book and lands in story out of nowhere. It is very disappointing to see that the book that the author has tried to sell a very weak story just on the basis of cheap language and sultry scenes. I mean I kind of find that very insulting. Final words on the book….skip it…its absolutely not worth the time and the effort that goes into reading a novel.